Presidents Vladimir Putin and Xi Jinping met in Moscow on Tuesday for talks before the G20 summit, as the US’ Donald Trump and Germany’s Angela Merkel also plan to meet ahead of the summit. The summit will also be the first time that Trump and Putin meet for talks. “The Russia-China relationship is really at a very high moment, because they agree on most of issues of global governance. They both disagree with the United States on THAAD, the missile defense system in South Korea, and they disagree with the United States on many other issues. They both want to have the Ukraine situation stabilized and they want Europe in peace. It is not very common that Moscow and Beijing agree on so many issues at this moment in history. So it is a high moment for the China-Russia relationship,” Li Xin said. Li noted that North Korea was a major topic of discussion for Xi and Putin. Earlier on Tuesday, North Korea launched a ballistic missile, which it claims has intercontinental capability and can strike anywhere on Earth. “This is very provocative for both China and Russia, so I’m sure they will discuss this because neither side wants North Korea to develop a serious nuclear program and missile program. I don’t know to what extent they can really cooperate and put pressure on North Korea, but North Korea indicates it’s willing to defy any challenges, so it’s going to be a very difficult question for them,” Li added. Li also said that the issue of interlocking China’s One Belt, One Road project with the Eurasian Economic Union was likely a major issue. 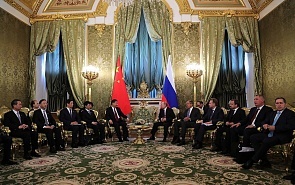 “China and Russia have agreed to build the Belt and Road project together with the Eurasian Economic Union. I’m sure there are going to be a lot of conversations on how these two projects, China’s One Belt, One Read and Russia’s the Eurasian Economic Union collaborate with each on that project to make the Eurasian economy work,” Li said. On the topic of the Middle East, Li said that Syria was likely the major issue, and noted that Russia and China have common views on the issue. “Both Moscow and Beijing agree that they want to see the Syrian situation get better, not worse, and on that issue they agree with the United States on how to deal with ISIS in Syria and other places. They want more stability, they don’t want to have chaos in Syria and other Middle Eastern countries,” Li concluded.